What is the average salary of a POAL wharfie? Home / Uncategorized / What is the average salary of a POAL wharfie? I have been trying to find out for some time what the average salary of a POAL wharfie is. My curiosity is because of the well publicised figure suggesting that it is $91,000. This figure seemed high, has been ridiculed by the workers themselves, and it has been bandied around in an attempt to reduce public sympathy for the Maritime Union workers and justify workplace reform. I have always thought the attempt to deunionise the site was wrong and that publicly owned entities ought not behave in the way that POAL has. I was happy to publicly express my support for a proper civilized negotiation process which included good faith bargaining. I have also previously expressed concern at the flow of information from Council Controlled Organisations. These are publicly owned entities but the corporate structure has I’m my humble opinion made the job of getting information much more difficult. So I thought that I would see if I could get POAL to release the information it relied on to justify its claims. After all I am an elected local representative and Auckland Council does own POAL. Surely the information would be made available to me. I have been trying to get a response from a variety of sources concerning this issue but so far have not received a satisfactory response. 1. How this calculation is achieved. 2. In particular what expenses and benefits it inclused. 3. Does it include superannuation payments. Doug replied by providing a fact sheet that had been given to Councillors. The information was interesting and did provide some information about how the wage was calculated. It said “Superannuation and medical insurance worth $2055 annually are included in the average remuneration figures”. But apart from this figure a breakdown was not forthcoming. “Thanks Doug the information is appreciated but does not answer the questions. “I have attached the information from the POAL website as it is a little hard to find and does provide some of the detail you have asked for. I was troubled by this. Surely Auckland Council should get some financial information about POAL? So I sent a further request. Thank you for your reply. Can I submit this further LGOIMA request because your original response is troubling. 1. What financial information is provided by POAL to ACIL? 2. Has Council asked POAL for confirmation of its claim concerning stevedores wages? 3. Has ACIL asked POAL for confirmation of its claim concerning stevedores wages? 4. Your response is interesting. Does Council have a policy that requires POAL to provide Council with accurate financial information because of its status as beneficial owner rather than under LGOIMA? PoAL submits financial information to ACIL that is related to meeting its performance objectives. 2. Has the Council asked PoAL for confirmation of its claim concerning stevedores wages. 3. Has the ACIL asked PoAL for confirmation of its claim concerning stevedores wages. 4. Does Council have a policy that requires PoAL to provide Council with accurate financial information because of its status as a beneficial owner rather than under LGOIMA. POAL is not subject to LGOIMA. As noted above PoAL reports financial information via ACIL to the CCO Strategy review Sub-committee. 5. Has my or any other request for information generated a request to POAL for information and if so what was POALs response? Thank you for your response. Nothing personal but it contains no useful information. For instance I wanted to know details about the financial information provided. You could have responded “annual financial reports” or “tax return figures” or “detailed breakdown of all areas of expenditure” or “whatever is on the website is what the Council is given” but your response is absolutely meaningless. And I appreciate that POAL is not subject to LGOIMA. But as an elected representative I thought that I should be entitled to some information given that Auckland Council is the beneficial owner of POAL. I ask that my request for more detailed information be conveyed to POAL and that you advise its response. In relation to the Ernst and Young review all that appears to have occurred is that someone has got their calculator out and done the same calculations. Can you ask POAL to provide the data sent to Ernst and Young. I must say that I have found this whole process frustrating. I feel like I have been given the runaround. 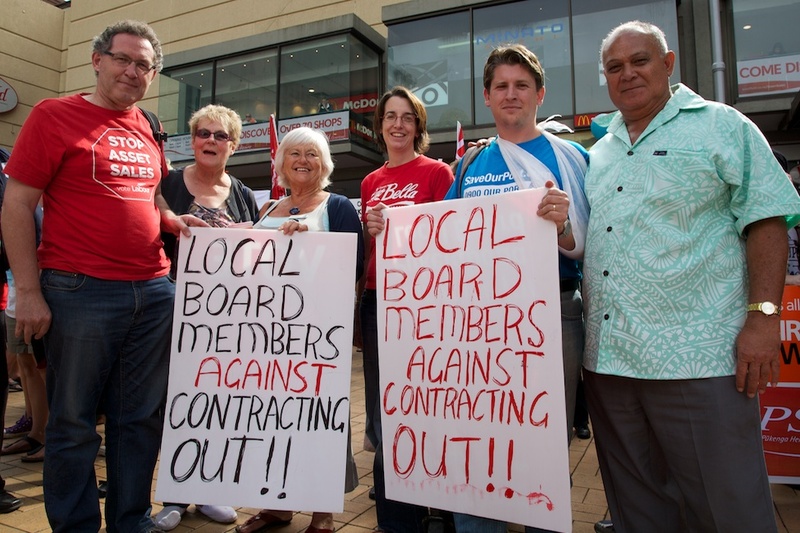 A publicly owned entity has put out information into the public arena that it has used in a battle to deunionise a worksite and drive down wages and conditions. Despite an elected representative asking it to justify its figures it refuses to do so. There is something wrong with the Council Controlled Organisations model in the super city if this can happen. Brilliant article. It goes to show the length of dishonesty and secrecy surrounding this immoral practice by PoAL. Thank you for attempting to find the truth behind the POA claim that $91k is the average salary for wharfies. It was a deliberate tactic to discredit their workforce, and the way they constantly mooted that figure made it seem that every wharfie earns $91k and only works 26 hours. My partner is a wharfie and we have just received his statement of earnings for the last financial year from the IRD. Considering the constant double shifts he works each week, the hours are well in excess of 40 hours a week, and taking into account the shift work and only having one weekend in three off, his income of $70,000 seems reasonable to me. Knowing the realities of shiftwork and the effects on the family, even if he did earn $91k, it would still be a reasonable income for the requirements of the job. Having been vilified in the media by his employers – Tony Gibson and Richard Pearson, and the hideous Whaleoil, plus the likes of Rodney Hide and Michael Barnett, as been overpaid and underworked, I am beginning to understand that their attitude – that working long hours to earn $70,000 to support a family of 5 is underworked and overpaid – is the reason why 50,000 Kiwis left the country last year to live in Australia. I can only see more and more people leaving NZ because of attitudes like this, there is no future in this country for blue collar workers under ‘leadership’ of this kind.